Britain’s most surreptitious artist Banksy has contributed new work to an anti-arms race exhibition titled Art the Arms Fair. The artist, whose identity may have been recently revealed by Goldie in a recent interview, has made a piece titled “Civilian Drone Strike”. 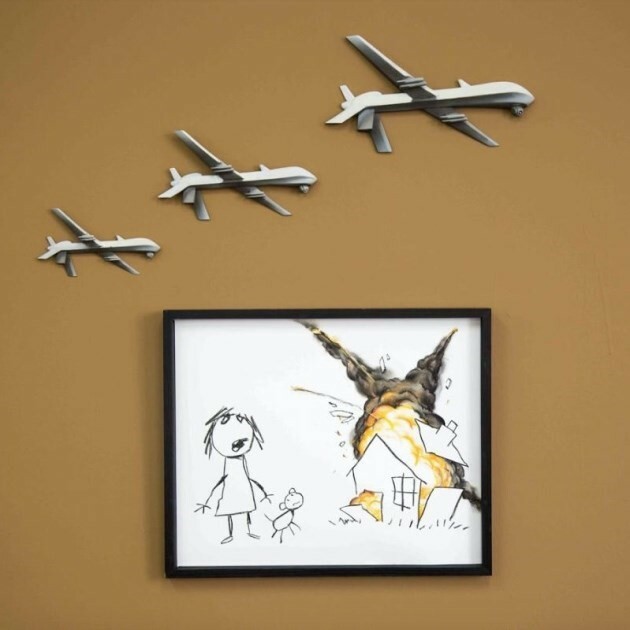 Though it that may look like a small doodle, it aims to have a large impact on one of the world’s largest arms fairs. The Defence Systems & Equipment International exhibition is held in London’s Docklands every two years. The last show was blockaded by eight anti-arms trade protesters, and after further inquiry, it was discovered that illegal weapons may have been on sale there. Banksy has taken part in an opposing exhibition whose purpose is to make the evil principles of DSEi visible to all. Plans are to see the piece auctioned off on Friday (September 15), and the proceeds of this work will be donated to the Campaign Against Arms Trade and Reprieve. Elsewhere, other Bansky spray paintings across the world face decay and demolition. Three original spray paintings will be lost after defunct Arches nightclub in Glasgow declared they do not have the money for restorative work. Across the channel in Calais, a lover of eggshell has “upgraded” a Banksy mural of “The Raft of the Medusa” by Théodore Géricault by painting over it. The building’s owner didn't realise that just by being there, the graffiti could potentially have increased the value of his property (let alone its artistic merit.) Nevertheless, the beauty of Banksy's work is that it could pop up at any time, like the recently uncovered sniffing cop, who was recently rediscovered on the side of a derelict London building following a 10 year absence. In recent times, Banksy has responded to contemporary political and social issues: with his Walled Off Hotel in Bethlehem on the West Bank, a spot with “the worst view in the world” that looks out onto the barrier that separates Palestinian and Israeli territories, and an art piece on Brexit. So get yourself down to the 7th Floor of Capstan House before it’s over, where you can also see other anti-arms works from Peter Kennard, Darren Cullen and Guerilla Girls.